For the safe drivers, a blind spot mirror is a great way to gain peace of mind. These are excellent in that they can help drivers locate other cars that may have been hidden with a regular mirror. To achieve the best effect of your new blind spot mirror, here are some tips. First, it’s important to differentiate between which ones you need. With some, you can peel off a sticker and affix it to either the top corner or lower bottom corner of your side mirror as either are the perfect blind spot mirror placement. With other vehicles, you may want a blind spot rear view mirror. To install, stop by your local department store or auto parts store to buy an installation kit. This will include all the items you need like rear view mirror glue. Next, you’ll want to attach it on a good weather day. Ideally, you want the temperature to be between 50-75F with low humidity. In winter, do it in a heated garage whereas in summer months park in the shade. Before attaching, you’ll want to find the best area to stick your new mirror. You can size up on the glass what is the appropriate height and go from there. On many models you can eliminate most if not all blind spots by setting the mirror at the correct height and angle. This is a trial and error process you’ll want to play around with before determining the best spot for the blind spot mirror. Then, you’ll want to make a mark on the button to ensure you will glue the right side. After this you’ll want to clean the button. Most installation kits come with sandpaper as this will be the best way to remove any old adhesive. Next, you want to take some rubbing alcohol and clean the area of the glass where you want to attach it. Lastly, you’ll want to open the glue then apply a small amount on the button. Now you want to press the button to the glass and hold for a minute. This will help the adhesive hold better. That way if you want to add rear view mirror accessories like fuzzy dice you can do so. 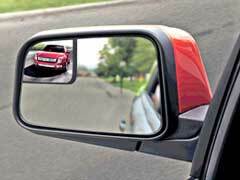 Either method you take, a blind spot mirror can help you see more of the road and the drivers around you. This can help you be more safe and provide you with peace of mind in the process.